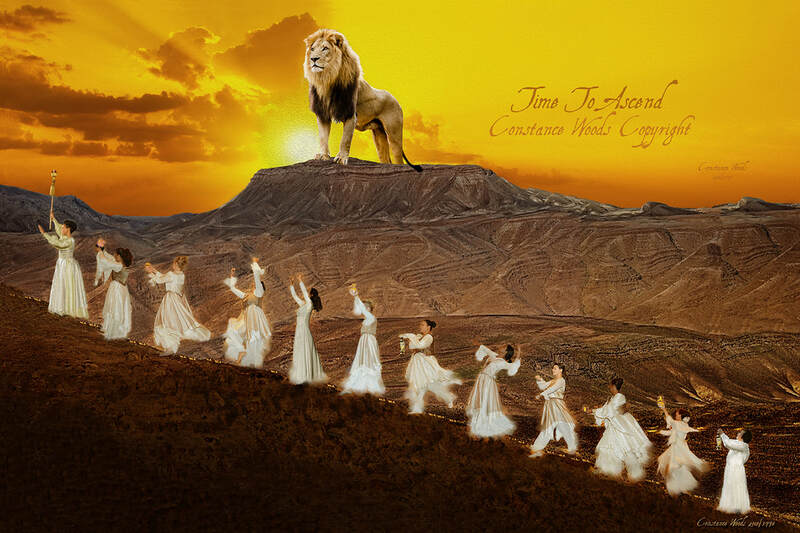 The Lion Of Judah, our King Of Glory is standing on the mountain in The Negev Desert with great anticipation as His worshipping warrior bride ascends to meet with Him. She is coming up out of the wilderness resounding with rejoicing and gladness. She dances in procession to her Olam El, Everlasting God. This artwork was completed in July 2018, based on the vision that God gave to Constance in 2005. After hearing Del Sanchez testimony, God gave Obadiah's Prophecy to her, with an open vision, and a word to bring teams of worshippers into the Negev. To come with pure worship unto The King Of Glory, and pray into the aliyah of Sephardim to the Negev. In October of 2018 the first-fruits worship trip was made: The King Of Glory Procession! Hallelujah. Click above for options to purchase this version with writing - This will not have the Constance Woods Copyright on the print. Please contact us for questions on this image. We are happy to customize and do variations.